Eli Pariser, CEO of Upworthy, speaks onstage at during the 2014 SXSW Festival in Austin, Texas. At its peak, the site, which is founded on a mission of promoting viral and uplifting content, was reaching close to 90 million people a month. See why we have an absolutely ridiculous standard of beauty in just 37 seconds. A boy makes anti-Muslim comments in front of an American soldier. The soldier's reply: priceless. You know it well. The Upworthy headline. That model of building curiosity by keeping the true topic of a story hidden until you click. You may hate them. But they work. By the end of 2013, at least two news outlets said Upworthy was the fastest-growing media site of all time. At its peak, the site, which is founded on a mission of promoting viral and uplifting content, was reaching close to 90 million people a month. Seemingly overnight, the newish company had changed the way the world wrote headlines, what it meant to create viral content and what kinds of expectations people bring to what they're clicking. But around November 2013, everything changed. Facebook began to introduce a number of alterations to the algorithm that controls your news feed on the site. Those changes threw Upworthy off a cliff. Upworthy told NPR that according its internal numbers and Google Analytics, in December 2013, its unique monthly website visitors dropped to 68 million from a high of 87 million. The month after that, they fell to 49 million. By November 2014, the site's reach plummeted to about 20 million, under a quarter of the traffic Upworthy experienced at its peak. 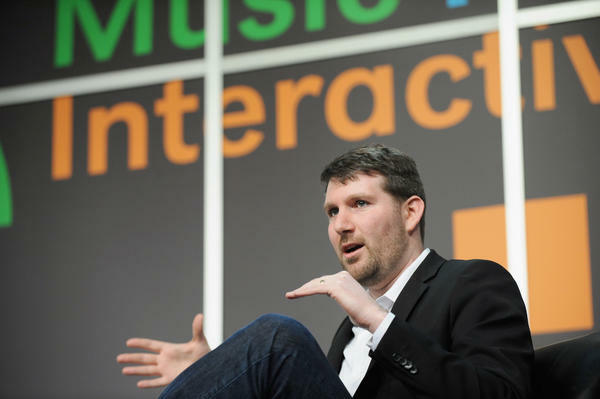 Upworthy CEO Eli Pariser speaks of the precipitous drop in muted tones. He never says he is mad at Facebook. That would be like being mad at the weather, he says. Pariser never says he thought about killing his website. And in an interview with NPR, he never spoke of having a big freakout moment when things started to come crashing down. "The roller coaster tide that is a startup is real," Pariser said. And he said that part of what kept Upworthy going (yes, the website still exists; yes, it is still making content) was its mission "of getting attention for important stories and activating and unlocking human potential." He says the company was always about more than "just hitting some numbers." Despite all the criticism, most Upworthy content is actually pretty positive. And that's by design. But Pariser also readily admitted that at least some of what Upworthy did was clickbait. "Were there particular Upworthy headlines that struck some people the wrong way?" he said. "Totally. Did some of them strike me the wrong way? Sometimes." He pointed out one headline that even he admitted was bad and misleading: "His first 4 sentences are interesting. The 5th blew my mind. And made me a little sick." That's actually a headline for a video about America's health care system, but you'd never know from that headline. Pariser said he'd score the headline a three on a scale of one to 10 (10 being the best). But then he quickly changed his mind. He said it really deserves a score of two. Facebook declined an interview request from NPR, but engineers there have spoken before about why Facebook's algorithm started to hurt headlines and stories like Upworthy's. In a recent New York Times Magazine piece, several engineers said they could see that people clicked on clickbaity headlines like Upworthy's a lot, but didn't stay on such sites for a long time after they clicked. And lots of stories that got lots of clicks didn't get lots of shares, another sign to engineers that the content wasn't valuable to Facebook users. Facebook determined that such stories were clicky, but not sticky. In a statement to NPR, a Facebook spokesperson said, "It's no secret there have been several improvements to News Feed in recent years. There has been clear communication about those updates, and why the community of people on Facebook wanted them — particularly in the instance of reducing clickbait and sensationalism." That spokesperson also said Facebook stands by the reporting in The New York Times about why Upworthy clicks suffered. Whatever the case, how do you bounce back after such a hit? Slowly — and with a little help. After the big dips in traffic, Upworthy hired a new chief story officer, Amy O'Leary. She said the company has pivoted a bit, focusing more on original reporting and hiring more writers. And yes, O'Leary said they've turned down the headlines. "If a headline maybe is saying, this story will definitely make you cry," she said, "one of the rules I have is I go back to the writer every time and say: 'Well, did this story definitely make you cry? Did you actually shed tears at your desk when you were working on this?' "
Traffic to the site still sits around 20 million unique users a month, still less than a quarter of the peak, but Upworthy says that through Facebook's News Feed, about 200 million people are reached by video and/or article content from Upworthy every month. It seems likely that Upworthy will survive, but its story offers lessons about another kind of viral content that seems to have taken over Facebook: fake news. While Upworthy's content and the stuff we've come to know as "fake news" are very different, they both have — or at least had — one thing in common: sensational headlines. "They really optimized this technique of manipulating people through headlines to coming to see that they might not want to see otherwise," said Jen Golbeck, a computer scientist who studies social networks at the University of Maryland. "You can blame them for opening that Pandora's box but still feel bad that they've lost a lot of their ability to do something that I think is a positive contribution to what we see on the Web and social media." Golbeck says the story of Upworthy also shows just how dangerous it can be for media companies to rely on Facebook for traffic. "It's like a devil's bargain — not to cast Facebook as a devil, necessarily," she said. There's another takeaway: It shows just how averse Facebook is to making any decisions around content that seem purely editorial. Remember, Upworthy was punished because of what the data said, not because Facebook said it was tired of clickbait and didn't like that kind of content. "Facebook has wanted to avoid any connection with being editorial," says Kurt Wagner, a senior editor at the tech blog Recode. "They did not want users to think that Facebook is deciding what you read and what you don't read." Instead Facebook said it was you that decided, with your clicks and shares, or the lack thereof. Upworthy's story is ultimately a tale of a Web redemption. It's also a reminder to those who might want our news feed to look a little different. Don't wait on Facebook to change. Facebook is waiting on you. At one point a few years ago, the left-leaning feel-good website Upworthy was the fastest growing website of all time. And then Facebook changed the algorithm that controlled its news feed. Way fewer people clicked on Upworthy post. NPR's Sam Sanders looks at what happened after Upworthy went downhill and what that says about the power of Facebook. SAM SANDERS, BYLINE: You know the Upworthy headline. Here's one. UNIDENTIFIED WOMAN: "The Things This 4-Year-Old Is Doing Are Cute. The Reason He's Doing Them Is Heartbreaking." SANDERS: By 2013, Upworthy and those kind of headlines - it was all reaching about 90 million people per month. But this content, especially the headlines - people called it click-bait, low-quality stuff just meant to grab eyeballs for the ad revenue. Has Upworthy ever made click-bait? SANDERS: That's Eli Pariser. He is the co-founder and chief executive of Upworthy. Even he admits some of the headlines were off. I asked him to give me an example of Upworthy click-bait. He found one from September 2013. SANDERS: Wait. That's the headline? PARISER: ...There's not a lot of - that's the headline. SANDERS: Wait. Say it again, slower - the headline. PARISER: "His First Four Sentences Are Interesting. The Fifth..."
SANDERS: "The Fifth Blew My Mind And Made Me A Little Sick." This was an article about the American health care system. PARISER: It's not, you know - or a two, you know? SANDERS: The CEO of Upworthy gave that headline a 2 out of 10. Around the end of 2013, traffic to Upworthy started to plummet. Ultimately Upworthy traffic declined by about two-thirds mostly because of Facebook. Engineers at Facebook told the New York Times recently that content like Upworthy's was just not valuable to Facebook users. Jen Golbeck agrees. JEN GOLBECK: They really optimized this technique of manipulating people through headlines to coming to see content that they might not want to see otherwise. SANDERS: Golbeck studies computer science and social networks at the University of Maryland, and she says sometimes websites like Upworthy leave telltale signs for Facebook. GOLBECK: They can see that you leave and then come back right away, that you're not really visiting the site to engage with what's there, which means you didn't like the thing you clicked on. SANDERS: Or Facebook and see when lots of people click on an article but don't share it with their friends. Those engineers at Facebook can tell when the content is clicky (ph) but not sticky. Upworthy pushed back and said Facebook changed their algorithm to promote Facebook content over Upworthy's. Whatever the case, there's a connection between the story of Upworthy and the rise of fake news even though Upworthy is not fake news. They mostly post inspirational content. That's actually their mission. GOLBECK: You can blame them for opening that Pandora's box but still feel bad that they've lost a lot of their ability to do something that I think is a positive contribution to what we see on the web and social media. SANDERS: Upworthy and fake news have or had one big thing in common - sensational headlines. And how Facebook dealt with Upworthy might show us how they'll deal with fake news. KURT WAGNER: For the longest time, Facebook has wanted to avoid any connection with being editorial. SANDERS: This is Kurt Wagner. He's a senior editor at Recode. That's a tech blog. WAGNER: And what I mean by that is they did not want users to think that Facebook is deciding what you read and what you don't read. SANDERS: Which means maybe the only way you're going to see less fake news in spaces like Facebook is if you and everybody else just consumes it less. As for Upworthy, they're still here. Amy O'Leary is the editorial director of Upworthy now. She says the company's focused on original reporting, more writers. And they've turned down the headlines. AMY O'LEARY: If a headline maybe is saying, this story will definitely make you cry, one of the rules I have is I go back to the writer every time and say, well, did this story definitely make you cry? Like, did you actually shed tears at your desk when you were working on this? SANDERS: And strangely enough, Upworthy recently partnered with Facebook to make them videos, which maybe makes sense when you consider what Upworthy's CEO, Eli Pariser, told me. He said being mad at Facebook about all of this would be like being mad at the weather. Sam Sanders, NPR News. Sam Sanders hosts NPR's newest podcast, "It's Been A Minute," a talk show about the news and culture of the week. The first episode is out on Friday. Transcript provided by NPR, Copyright NPR.